Virgin boss Richard Branson believes that the average middle class family will be able to afford space trips 'within his lifetime'. In an interview with Digg, Branson revealed he is confident his Virgin Galactic venture can bring prices down from the current mark of $200,000 for the maiden voyage of the reusable spaceship, to a price comparable with a trip to Australia. Branson, being interviewed by Arianna Huffington, explained that it was his disappointment at space flight being the sole domain of governments that prompted his move into space tourism. "I watched the moon landing and I thought that in my lifetime that I would go to the moon, and thought that my children would go to the moon," said Branson. "The problem was that space travel is being run by governments, the Russian government and the American government and they've never been interested in you, me or middle class families going to space. "So in 1990 I formed a company called Virgin Galactic Airways and I went out looking for engineers who could build a reusable space rocket to take ordinary families one day into space." Branson firmly believes that, given an affordable option, people would be flocking to orbit in order to experience space for themselves. "I thought most people would like to go to space if it was affordable and we could guarantee them a return ticket," added Branson. "Initially its going to be expensive - it will be about $200,000 a ticket - but those people who are paying that are going to be pioneering the possibility of middle class families eventually going into space." 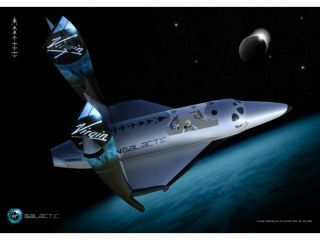 Branson insists that proper space tourism is not merely a future dream, but could happen soon. "I'm absolutely certain that in my lifetime, most middle class families will be able to afford to have a trip into space," Branson stated. "We're building a wonderful spaceport in New Mexico, we've got genius engineers working on it, we're going to make the whole experience magnificent and I really do hope that we'll be able to get the price down so that people will think 'do I want to go to Australia or shall I go into space?'"